Dogs are an absolute delight to have as pets. They're hyperactive fluffballs that turn the house upside down during the day. But once you become a dog owner, you'll notice that your dog sleeps a lot more than you imagined. So what is the real deal with dogs and their sleeping patterns? How are they so energetic with the short, frequent naps they take? And do canines actually dream during their sleep? Well, if these are some questions that are running through your mind, you’ve come to the right place. I'm here to give you all the answers you're looking for. 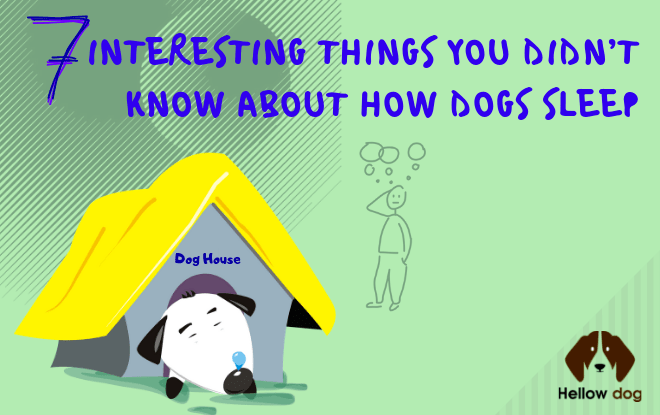 Keep reading to find out everything you need to know about dogs and their slumber time! Much like humans, dogs have two phases of sleep. However, there is a difference in their sleep patterns. We, humans, stay awake for 15 to 17 hours and usually sleep for 7 to 9 hours. For dogs, sleep comes in spurts. They tend to follow a cycle of 16 minutes shut-eye and 5 minutes awake time. Unlike us, dogs can wake up very easily from their REM sleep. This would be pretty useful for them in the wild, as they’d be able to warn their packs about any nearby danger. Nowadays, it’s useful for pet-owners too because our dogs can alert us of unwanted intruders. A lot of times, dogs wake up without even completing one sleep-wake cycle. So basically, to get enough sleep, dogs need to sleep more frequently than humans. When your dog starts to drift off, it experiences the non-Rapid Eye Movement (NREM) sleep. In the first phase of NREM, your dog’s muscle activity starts slowing down. At this stage, your dog is tired and is transitioning to sleep. In the second stage, your dog is fully calm but still has an active brain. Your dog finally goes into a deep slumber in the third stage known as slow wave sleep (SWS). This is when your dog’s heart and breathing rate reduces, and its blood pressure falls. After 10 to 15 minutes of SWS, your dog enters the Rapid Eye Movement (REM) sleep. True to its name, during REM sleep, your dog’s eyes will roll under its closed eyelids. And, you know how sometimes your dog moves or makes noises during its sleep? Well, it’s probably because your dog is actively dreaming in the REM stage! 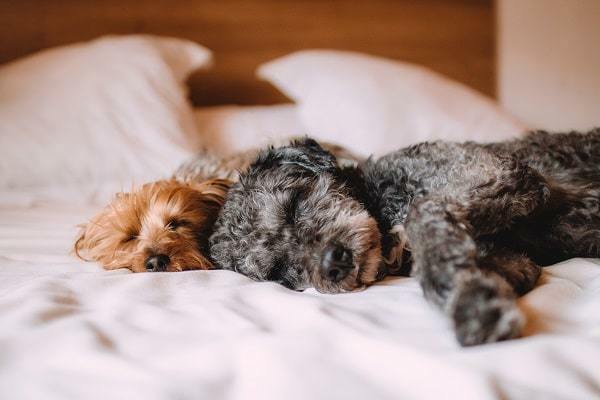 How Much Sleep is Normal for Dogs? Generally speaking, a healthy adult dog sleeps 12 to 14 hours every day. So, basically, throughout the day, a dog will be awake 20% of the time. So, does it just sleep the rest of the time? Well, no, but it’s not fully awake either. Around 50% of a dog’s time in a day will be spent sleeping. The rest of the 30% is spent resting in an awake, but inactive state. What Factors Affect a Dog’s Sleeping Patterns? The sleep patterns of dogs vary with different factors. Here’s a basic list what really determines how much your dog sleeps. All dogs need a lot of frequent sleep. 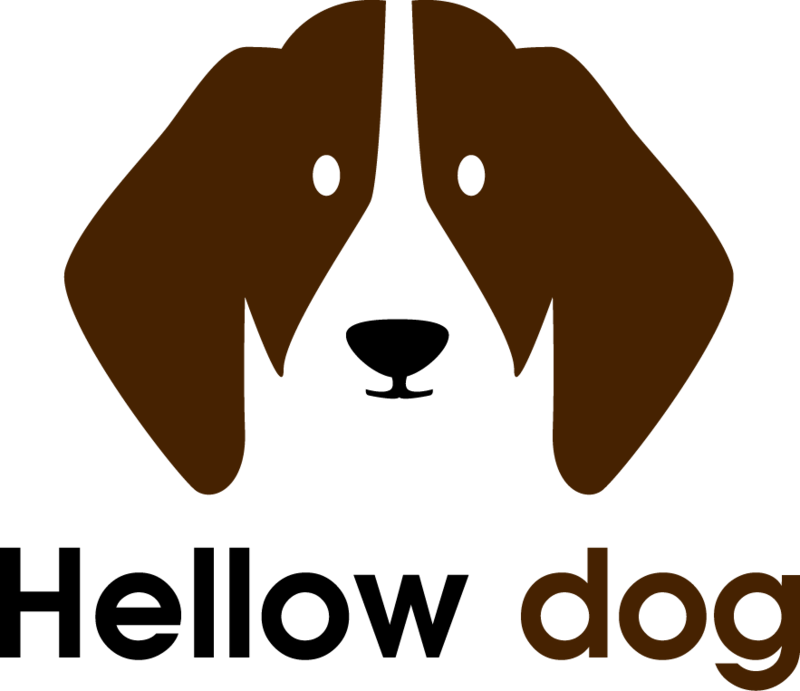 However, larger dog breeds are known to doze off longer than their small counterparts. So, if you’ve got a Saint Bernard or a Mastiff, you’ll probably notice your giant fluffy companion spending more time asleep than awake. How much sleep do puppies need? Like babies, puppies sleep a lot. In fact, they can sleep for more than 18 hours daily! This is actually vital for them to grow up healthy and develop properly. Senior dogs also sleep a lot more frequently and for longer periods. If your dog is suffering from some sort of health problem, its sleep patterns will change. Conditions like diabetes, arthritis, heart disease and hip dysplasia can cause dogs to sleep more. On the other hand, if your dog has sleep apnea, it will have bad quality sleep. This is usually seen in dogs with short noses. If your dog isn’t on a proper diet, it will affect his sleep. Without the right nutrients, it won’t have the energy to stay awake or active. Be careful about giving it food that is difficult to digest too. You don’t want your dog spending all of its energy on digestion! Yes, readers, dogs too can be depressed! And like us, when they experience something upsetting, it affects their life. Dogs are creatures who love routine. So, any change in their surroundings or lifestyle can impact their lives greatly. Incidences like an owner passing away, losing their babies or even moving houses can be quite distressing. When dogs suffer from something like this, they tend to sleep more. Even street dogs sleep more than domestic dogs. Wild dogs spend a lot of energy chasing and looking for food. A lot of times they don’t get food and need to save up energy by resting. Service and working dogs like sled pullers and police dogs, however, stay awake more. These breeds can stay away and work for long hours though training. Mental and physical stimulation are needed by dogs to stay energetic and awake. If dogs don’t get enough exercise, they sleep for long hours. Also, if your dog is super inactive all day, it will sleep out of boredom. This is a huge problem because, at night, it will most likely not be able to sleep anymore. This is something dogs with working owners usually suffer from. Every dog owner has probably laughed at the way their dog is sleeping. I for one always whip out my camera, because my dog sleeps in such weird positions. But what do they really mean? Here are a few explanations for the most common canine sleeping positions. If your dog sleeps sideways, with four of its legs stretched out, it means your dog is relaxed. There’s not a worry in its mind, and it’s just taking the time to rest. This position also makes its cute belly stick out in the open. This is most likely your dog’s way of staying cool. Ever noticed your dog sleeping on its back, with four paws up? Well, I certainly have, and these are the pictures that get the most likes! It’s very hard to spring up from a position like this, and it makes your dog very vulnerable. However, if you find your dog this way, you should be flattered. It means that your dog feels safe around you. The belly being out also means your dog is trying to cool down. When the dog sleeps is in a curly position like a ball, it’s the easiest way for them to get up suddenly. They sleep in this kind of posture for defense, and it isn’t very comfortable either. Usually, dogs who have been in hostile environments, or have trust issues sleep this way. But sometimes they sleep this way to stay warm as well. Sleeping on the stomach means it’s more of a light rest for dogs. This type of position is not a relaxing position for them, so they’re not really going into a deep slumber. In this position, your dog can also spring into action at any time. A lot of dog owners like to sleep with their dogs. And why not? Dogs are cuddly companions that keep you warm all night. However, you should get a mattress that absorbs movement, so their rotating doesn’t bother your sleep. Point to consider is how your dog sleeps with you? Your bed should also be big enough to fit both of you. Memory foam and latex are pretty good mattress materials for this purpose. When your dog is sleeping in bed, it should be big enough to fit your dog. Place soft blankets and chewable toys for comfort. Even placing one of your old cloth items that have your smell might be a good idea. The bed shouldn’t be in a very cold or noisy area either. You could even consider buying a heated dog bed for those chilly winter nights. 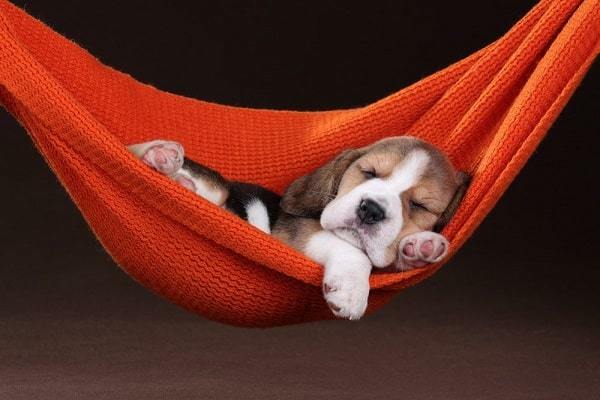 To ensure your dog is sleeping well, make sure it’s sleeping area is comfortable. Other than that, you should give it a proper diet with all the necessary nutrients. And don’t forget, the food has to be easily digestible! Make sure that you fit in 30 minutes to walk your dog every day. In case you have a larger dog, it will naturally need more than this. If this is not possible, then hire a dog walker! Also, when you leave your dog at home, keep some mentally stimulating toys behind. Several puzzle toys involve finding treats. Such toys will keep your dog’s brain active and prevent boredom. Now that you’re at the end of the article, I hope your questions have been answered. 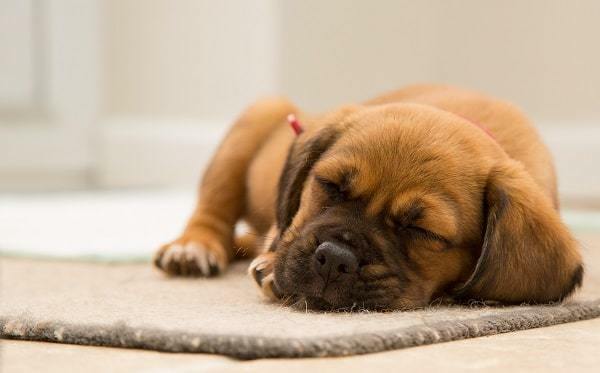 Just like humans, dogs need sufficient amounts of quality sleep to stay healthy. Although the usual amounts of sleep may vary with different dogs, you should be observant of their sleep patterns. In case you suddenly notice a change in your dog’s sleeping behavior, you should definitely consult a vet. Sleep problems can often be symptoms of more severe problems like Lyme disease, parvovirus or even hypothyroidism. Hopefully, the great mystery of your dog’s slumber has been solved. So now you can go on and be a well-informed doting dog parent!